Next generation, Vinyl Polyether Silicone (VPES) fit checking material. Excellent hydrophilicity ensures saliva no longer affects performance. Minimal film thickness allows detection of high spots and pressure points. Tear resistant but peels away easily and cleanly. Ideal for use in checking crown margins, proximal and occlusal surfaces, precast posts and inlays. 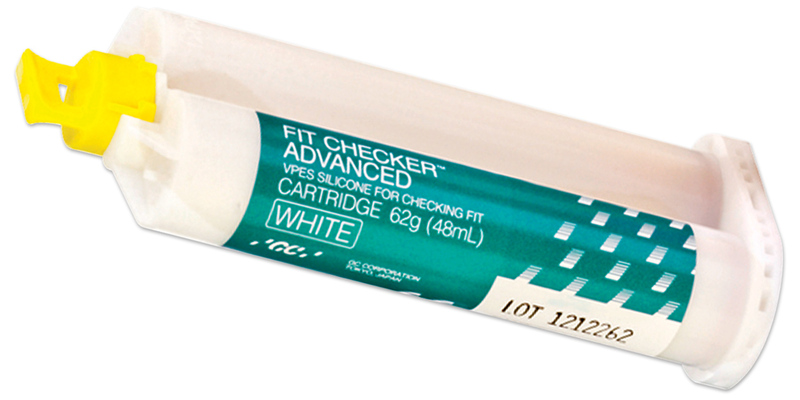 Use the blue color for checking fit of all ceramic dental restorations. Pleasant scent and taste. Contains: 55g tube base, 50g tube catalyst, 3g retarder, mixing pad. Contains: 2 x 62g (48ml) cartridges, 6 mixing tips. Mixing tips have yellow hub, clear barrel and white mixer.